The Chanin Language Center is a specially designed space for Hunter students who wish to study foreign languages. The Language Center makes possible total language immersion in an international atmosphere. The Center includes a large multimedia facility/lecture hall, a lounge, a library, a lab and a multimedia classroom. 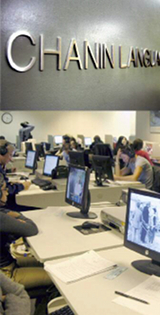 The space is designed so that students are afforded ample opportunity to practice the foreign language being studied through films, audio and video programs, and lots of interactive computer language-applications available to individual students and classes. The Language Center is located in Room 209 Hunter West. We can be reached at (212) 772-5700.